Co-founder of the Westben Arts Festival Theatre, Canadian soprano Donna Bennett is known to audiences internationally for her performances ranging from opera and oratorio to Broadway and musical theatre. Operatically, she has performed leading roles at the Edinburgh Fringe Festival, the London International Opera Festival, the Henze Festival in Montepulciano, Italy, as well as in Berlin, Neuberg, Toronto and New York. Other career highlights include the role of Dede in the British premiere of Bernstein's A Quiet Place and Ariana in the world premiere of R. Murray Shafer's The Enchanted Forest. 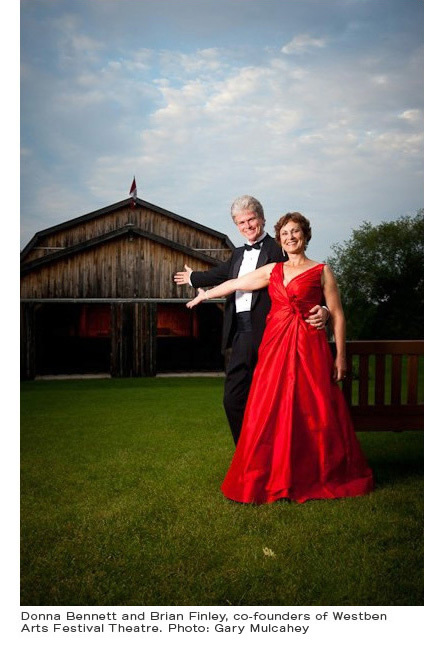 In Canada, Donna has sung with the Canadian Opera Company, the Royal Opera, Opera Atelier, Toronto Operetta Theatre, Tafelmusik, Toronto Symphonietta, Orchestra London, Victoria Symphony and the Kitchener-Waterloo Symphony Orchestra. Having toured extensively across Canada with pianist and husband Brian Finley, Donna’s discography includes Henze's opera The English Cat and a collection of Mozart Arias and Lieder recorded live at the Olympic Music Festival in Washington, A Christmas of Love & Light, Lullabies for Benjamin, and Love's Old Sweet Songs. In addition to several recitals and orchestral appearances, her performances with Westben include roles ranging from Maria in The Sound of Music, Mary Magdalene in Jesus Christ Superstar , Delilah in Brian Finley’s opera-musical SAMSON, the title role in Brian’s Rapunzel opposite Michael Burgess and in June 2010 Donna created the role of Linette in The Selfish Giant a new musical by Brian and Ken Tizzard. Several of her performances have also been recorded for CBC, CFMX, KING-FM (Seattle), and the BBC in London.